Methods: We accumulated a survey asking patients at their level of pain and discomfort performing certain tasks. The survey consisted of 5 questions with the first modeling that of the Carolina Comfort Scale, a product of Carolinas Medical Center. These surveys were scored 0-49 with a score of 49 being considered the highest risk group for recurrence and post-operative pain or decrease in functionality. Cousin 4-D Dome mesh is considered a “effective and safe” prosthetic according to an animal study yielding only three complications (seromas) which eventually resolved on there own1. 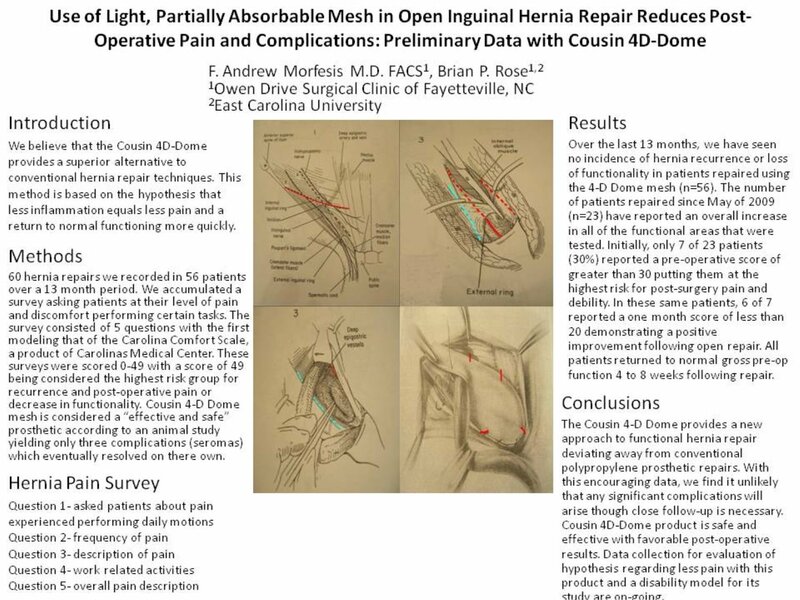 Results: Over the last 13 months, we have seen no incidence of hernia recurrence or loss of functionality in patients repaired using the 4-D Dome mesh (n=56). The number of patients repaired since May of 2009 (n=23) have reported an overall increase in all of the functional areas that were tested. Initially, only 7 of 23 patients (30%) reported a pre-operative score of greater than 30 putting them at the highest risk for post-surgery pain and debility. In these same patients, 6 of 7 reported a one month score of less than 20 demonstrating a positive improvement following open repair. All patients returned to normal gross pre-op function 4 to 8 weeks following repair. favorable postop results. Data collection for evaluation of hypothesis regarding less pain with this product and a disability model for its study are on-going.